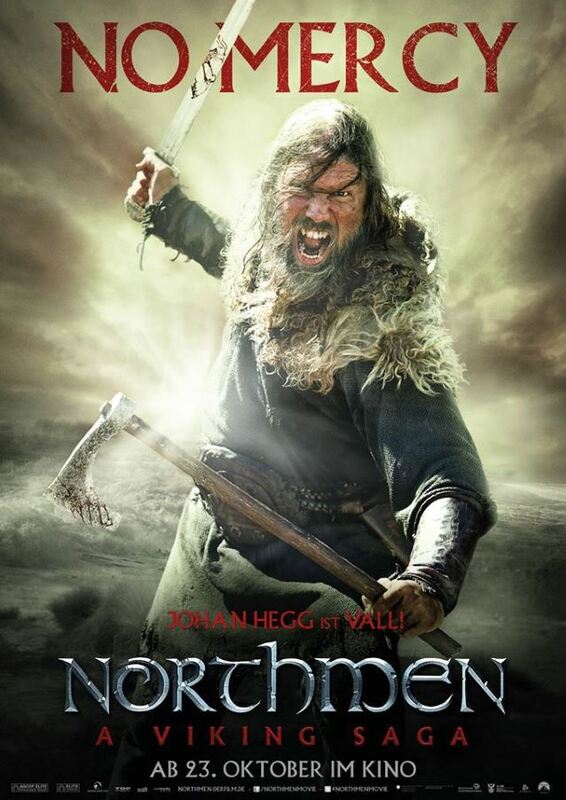 Vocalist Johan Hegg of Swedish death metallers AMON AMARTH last year joined the cast of "Northmen - A Viking Saga". Hegg plays Viking warrior Valli in the film, which was shot for eight weeks primarily in South Africa, with some additional shooting in Germany. Johan comments on his role: "Valli is a very experienced warrior and has a strong bond with his younger brother Bjorn. Valli looks brutal with his broad back and leather-dominated clothing. He has already experienced and survived a great deal. His face is full of scars." Plot synopsis: "In the 9th century a group of Vikings, commanded by captain Asbjörn, is approaching Britain, aiming to plunder the rich monasteries in the north of the island. But their ship gets caught in a storm and is smashed to pieces on the rocks off the coast of Scotland, the only part of Britain without any Viking settlements. When Inghean, daughter of the Scottish King Dunchaid, by chance falls into Viking hands, they see the opportunity for demanding a large ransom. King Dunchaid immediately sets his 'wolfpack' — a group of mercenaries well known for their savagery — on them. The Northmen with their hostage now have to force their way through the rough highlands, where they meet the brave and mysterious Christian monk Conall. Having the wolfpack close on their heels, a desperate race against time begins. A battle over life and death..."
A new trailer for "Northmen - A Viking Saga" can be seen below. The movie is set to receive a theatrical release in Europe on October 23. Ralph Dietrich, chief executive officer, Ascot Elite Entertainment Group said about Hegg's involvement in the film: "It is an honor to have metal icon Johan Hegg set sail with us and we could not be more excited. Such a fitting addition, Johan's music, as the lead singer of AMON AMARTH, is synonymous with the Viking experience that we are bringing to life in 'Northmen - A Viking Saga'." "Northmen - A Viking Saga"'s international cast also includes Tom Hopper ("Knights Of Badassdom", "Black Sails", "Merlin"), Ryan Kwanten ("True Blood", "The Right Kind Of Wrong"), Ken Duken ("Das Adlon", "Inglorious Basterds"), Charlie Murphy ("Philomena", "The Village"), Ed Skrein ("The Sweeney", "Ill Manors", "Game Of Thrones"), Anatole Taubman ("Quantum Of Solace", "The Tudors") and James Norton ("Rush", "Belle"). Directed by Claudio Fäh ("Sniper: Reloaded", "Hollow Man 2") and scripted by Matthias Bauer and Bastian Zach, the film is co-produced by Elite Filmproduktion AG, Two Oceans Production and Jumping Horse Film GmbH. The producers are Karin G. Dietrich, Ralph S. Dietrich and Daniel Hoeltschi for Elite, Giselher Venzke and Bertha Spieker for TOP and Marco Del Bianco, Frank Kaminski, Ulrich Stiehm and Rolf Wappenschmitt for Jumping Horse. VFX production is by Day For Night GmbH. Nordmedia Fonds GmbH has subsidized the project's development, with production financing from Mediengesellschaft Niedersachsen/Bremen. "Northmen" receives further subsidies from South African National Film And Video Foundation (NFVF) and the Department Trade And Industry (DTI).